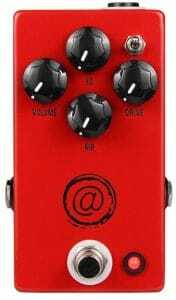 In 2016 JHS Pedals brought out the JHS AT Signature Drive pedal for the amazing guitar player Andy Timmons. Featuring a 3-way toggle switch to go between 25, 50 and 100 Watts of headroom with dials for Drive, Air, EQ control and Volume. The AT could also run on 18v (rather than your standard 9v) for even more headroom. For those who think 9v of power isn’t enough, fear not! You can run the JHS AT+ at 18v for even more headroom! The 2018 Andy Timmons Signature AT+ still has all of the original features carried over from the first AT pedal. The drive channel is identical to the previous model and the EQ, Volume, Air dials and the 3-way Wattage toggle switch all remain the same. The newest feature here is the extra boost dial, activated by a separate footswitch to the right of the main footswitch that activates the pedal. This boost is set before the main drive channel inside the pedal to either be used independently or to push the drive channel even further without sacrificing tone quality. The EQ works as a regular dark-to-bright tone control whilst the Air dial brings in some higher end for clarity. Allowing you to finesse the EQ section before or after drive. 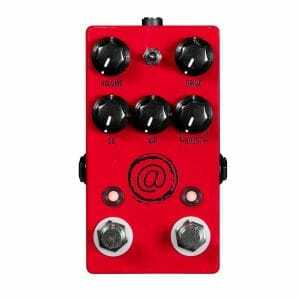 The 3-way toggle switch provides you with the affect amplifier wattage has on tone. 25 Watts (up) position gives you the most compression and saturation at the lowest volume. 50 Watts (down) position still gives you some compression but more openness than 25w. Finally, 100 Watts (middle) position delivers the most volume and crunch but is less focused than 50w.